1. If ball’s speed at point A is 6 m/s, ball’s speed at point B is √92 m/s, and acceleration due to gravity is g = 10 m/s2. What is the height of point B (h)? At point A, ball’s speed = 0, so the kinetic energy of the ball = 0. KE = 1/2 m v2 = 1/2 m (0) = 0. 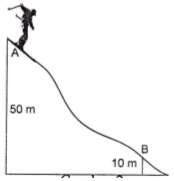 If the initial velocity = 0, the acceleration due to gravity = 10 m/s2, then what is the speed at the height of B.